It's spring cleaning time, and I love throwing open the windows and filling the house with the scent of fresh linen, clean floors and polished wood. After you've tackled those dust bunnies under the bed and dusted down cobwebs from the corners, spare a thought for your skin. After a long winter of cold wind and dry, forced-air heating, things are bound to be a bit of a mess. Once a week, I like to do the skincare equivalent of a quick hoover 'round with a quick and super-effective exfoliating mask - working like a gentle peel, they leave skin soft, smooth and bright. Sweep dead skin, splotchy pigment, blocked pores and general dullness out the door, leaving skin deep-cleaned, glowing, and rejuvenated. I love the Dr Sebagh Deep Exfoliating Mask for it's heavy duty, deep-cleaning prowess - a 10 minute spa treatment in a jar, it brightens, smooths and reduces hyperpigmentation with azelaic and lactic acids. A cult classic (I've already gushed over it here) with a price tag to match, it's available in two strengths,and is worth every penny. The REN Glycolactic Radiance Renewal Mask is the perfect mid-range workhorse - effective enough to show instant results but gentle enough to be used regularly, it harnesses glycolic and lactic acids from fruit sources for cleaner, smaller-looking pores and smoother skintone. Extra points for the tidy and hygenic bottle. Juice Beauty's Green Apple Peel exfoliates with alpha hydroxy acids from its organic apple, grape and lemon extracts for a fresh smelling, quick acting clean - available in sensitive and full strengths, it's gentle, effective and utterly natural. If you're planning to use a gentle peel this spring, remember the basics - apply to cleansed skin, and always start slow - three minutes is a good gauge of how your skin will react. Acids tingle and sting slightly as they work, but shouldn't feel unpleasant or burning. Remove with a warm washcloth, and follow up with a nourishing moisturizer - skin should look glowing or slightly flushed. Obviously, be careful you have incredibly sensitive, reactive skin - though for the record I have quite sensitive skin and have used all three of these with good results. Most importantly, remember to be vigilant about the sun after any sort of acid exfoliant - all that baby-soft, delicate new skin needs to be protected! 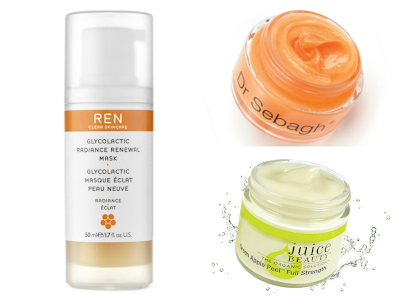 I love to try different masks, and I have to admit, I have not tried Dr Sebagh Deep Exfoliating Mask. I'll put that on my list. Thank you for the suggestions!